Brussels, 16 March 2017 – The first prize of the seventh John Houston EPACA ESSAY CONTEST 2016 was handed over by Jean Claude Lahaut, member of the EPACA Professional Practices Panel to François Barry from Cambre Associates during EPACA’s Annual General Meeting, 16 March 2017. The jury is composed of the members of the EPACA Professional Practice Panel: Lisette Tiddens-Engwirda, Jean Claude Lahaut. The John Houston EPACA 2017 Essay Contest, with the topic “A world of distrust: how does it affect Public Affairs”, aimed to highlight the Public Affairs profession and bring recognition to young practitioners. 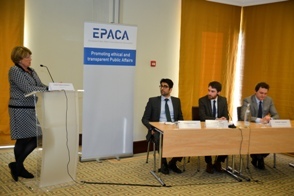 Young talents under the age of 30 and working for consultancies member of EPACA were invited to take part in shaping our profession by sharing their views and experiences in an essay competition. The Jury was the members of our Professional Practices Panel. François Barry was unanimously designated by our Jury as the winner. His essay showed both talent and originality! Runners up in the contest were Saagar Dattani, from GPlus Europe ranking second, and Andrea Tognoni from Cambre Associates ranking third. We congratulate them for the excellent quality of their essays. Power and abuse; bank and failure; tax and evasion – some words have been getting a little too cosy with one another over the years. Others just seem to be moving with the times; revelation has become more synonymous with scandal than it is with discovery; whereas wealth seems to prefer the exoticism of offshore than the trouble of redistribution. Semantics has evolved and distrust has taken over confidence. Instinctively, public distrust forces Public Affairs professionals to be more transparent, more pedagogue, and Public Affairs engagement to be less slogan-driven and further evidence-based. In Europe, this has resulted, for instance, in ever-stricter transparency registers and ever-growing research teams in Public Affairs consultancies. What better way to regain someone’s trust than by leaving your door open and proving you actually know what you are saying. The problem, however, is that distrust – of politicians, democratic institutions, economic operators – is not the mere absence of trust but is much harder to grasp. Recent elections on the international scene were quite telling; paradoxically, facts and transparency seem to be losing some of their appeal as distrust grows. Transparency and fact-checking in Public Affairs must be recognised for what they are, namely an absolute necessity for a healthy democratic process. Distrust, on the other hand, is just yet another new endogenous variable in the Public Affairs equation, like digitalisation or public scrutiny. What nurtures distrust is disconnection. Leaving the door open is not enough. Public Affairs practitioners should encourage citizens to step in and take part in policy-making. The development of e-participation services goes in the right direction to reconcile citizens and smaller companies with remote decision-makers. The Public Affairs community has every interest in empowering citizens and in proactively supporting initiatives intending to do just that, such as the 2016-2020 EU e-government action plan. When I first interviewed for a position in public affairs, I was asked ‘what do you believe is the most important objective a public affairs organisation should set out to achieve’? Without hesitation, my response was credibility. In my opinion, credibility is built through two main strands – transparency and trust. For years, various measures have been taken to improve transparency in public affairs, for instance, through transparency registers, and obligations to publicise budgets associated with our represented interests. Yet, whilst transparency has improved, trust in public affairs remains a grey area. Perhaps, this lays in the broader purpose of public affairs organisations – to push their interests’ side of the message – vehemently and confidently – in order to shape opinions, regardless of the extent of opposition they face. Or perhaps this lays in competitive nature of the industry; a zero-sum game, where organisations continuously compete for stakeholder acceptance. Nonetheless, in theory, trust is pivotal to a successful public affairs strategy. Not only is trust required to persuade your represented interest that you are the best organisation to convey their message,but it is also critical for establishing and maintaining relationships – both social and personal – with those very interests, too. In reality, from an emic perspective, institutions – such as those in the European Union – have consciously altered their regulatory bodies accordingly, to accommodate for and legitimise interest groups within the political space. Take for instance the European Commission, which now formally considers ‘expert interests and inputs’ prior to formally proposing legislation for debate. Therefore, in essence, the responsibility now lies with the public affairs organisation, to build credible relations – through maintaining trust and transparency – in order to legitimately, and actively contribute to the elite pluralistic arrangement that currently exists in European public affairs. Decades-old certainties and social structures shackle, networked masses enact a backlash to that globalisation that connected them, and absolutes becomes rare. Hardly anything really new to our “post-fact” world, except pace and scale. History goes on, once untouchable assumptions get questioned. Professionals, solutions and their truth-holders lose an indispensable tool of the trade: trust of their system. Many suggest communicating more and better, but for what? What is this trust that we need? The English word trust comes from the Norse ‘traustr’ – strong. This enshrines the paradigm shift in our profession whereby a message’s repetition and power became its essence. As politics became marketing and entertainment, form and technique hijacked the game. As policies surrendered to quarterly quantitative results, cosmetics and numbers became objectives. Depth turned complex, analysis inapplicable, long-term strategy untestable and sustainable solutions elusive. The Latin word for trust was however ‘fides/fidere‘ – (to) hope, (give) faith. This is perhaps the facet that we lost, one of inspiration and ambition, empathy as shared understanding, hope as common undertaking. 2016 (should have) reminded us that we do not know everything. But public affairs professionals continue to profess that they do. So how do we retrieve trust? We have to integrate both sides of it in our work to face politics’ comeback at all levels; listen and understand what we face before trying to explain, package or sell it; evolve to put the subject of trust (people) at the centre. All communication is based on understanding: no audience will listen to what it does not care about. To inspire trust let us show we care about what people care about and we understand why. Not because of, but through the strength of expertise. Not defying, but inspiring emotion. Losing it, to take back control.